It would be amazing if Santa would just leave us Chick-fil-a in our stockings on Christmas morning but he seems to overlook that on my list every year. In the fun and excitement of Christmas morning, breakfast is often something that can be overlooked. Well today, I thought I’d share a couple of our Christmas morning breakfast traditions because they involve a lot of bacon and nothing makes opening gifts around the fire better than a side of bacon. Every Christmas morning that I can remember, my mom would make us bacon pinwheels. So of course, I make them myself when Tim and I are on our own on Christmas morning and I’ll make them for our little June Belle someday too. And to compliment the bacon pinwheels, I also make a side of bacon crackers :) But, don’t worry, it’s not all bacon around our house on Christmas morning. I usually make Landyn’s french toast bake or I cheat and grab some of the Immaculate Baking Company cinnamon rolls (they’re the best!) that way we have a little sweet to go with our savory. Clearly, healthy eating is a top priority on December 25th. The bacon crackers are simple but they do take some time to bake so you’ll want to pop them in first thing. I’ll show you the steps and the full recipe is at the end of the post. Lay out a sleeve of crackers on cooling racks on a cookie sheet and sprinkle each with a teaspoon of parmesan cheese. Cut a pound of bacon in half and wrap each cracker in half a slice of bacon. Bake on 250° for 2 hours. 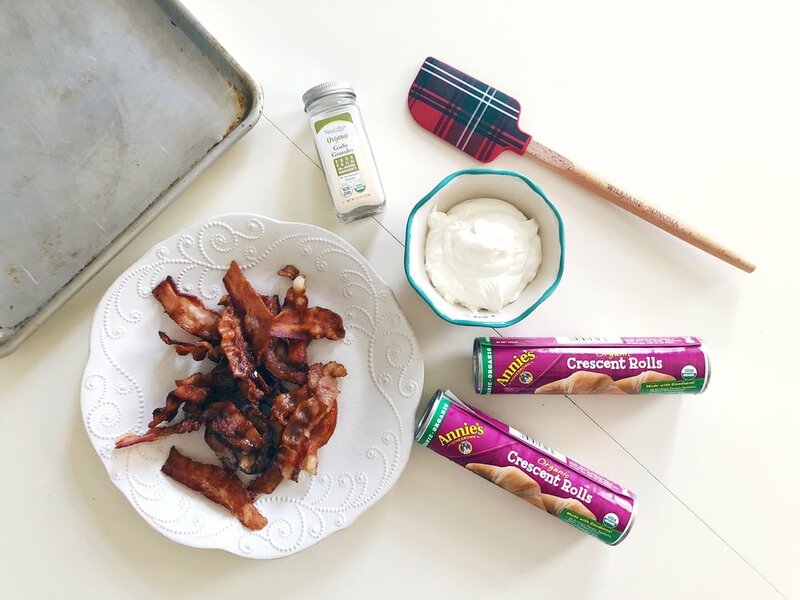 The pinwheels take less time, just four ingredients: crescent rolls, sour cream, garlic powder and duh, bacon. First, you unroll the crescent rolls and flatten either with a rolling pin or your (clean) hands. You want two rectangles. Spread on a layer of sour cream. Sprinkle on the garlic powder and crumbled bacon and then roll up the dough. Once you have both rectangles rolled, cut them each into 12 pieces and place on an ungreased cookie sheet. Bake at 350° for 9-11 minutes. Serve these delicious bites to your family in the living room while they’re opening presents and they’ll think you’re better than Santa himself.